All the popular TV shows of the 1980s and 1990s were made by private producers, who paid Doordarshan to use its unbeatable reach to the masses across India. New Delhi: Before the 17 October board meeting of Prasar Bharati, Jawhar Sircar, chief executive of the public service broadcaster that runs Doordarshan and All India Radio, was tense. With less than a month to go at the helm of Prasar Bharati, Sircar had been working overtime to prepare his arguments to revive the prime-time programming slot auction that could not materialize earlier because of internal dissent. “This is the last battle of my service life and I better win it," said the chatty CEO who resigned on 3 October, four months before his scheduled retirement due in February 2017. Sircar plans to leave the organization on 4 November, just after Diwali and will relocate to Kolkata. “But, I am not running away. I won’t leave without completing the slot auction process," he said. Ever since Doordarshan shelved the auction plans after conducting two failed application rounds, Sircar has left no stone unturned to revive the process. At the 137th board meeting held at 11.30am on 17 October, a Monday morning, the entire board gathered in the conference room of Prasar Bharati’s office on the second floor of Press Trust of India building on Parliament Street. The agenda was to discuss the suspended auction as well as Doordarshan’s future. Even though some leading production houses like Balaji Telefilms had evinced interest in the auction, Doordarshan decided to scrap it, citing shortcomings in the applications. The broadcaster had received seven applications from production houses, including Ekta Kapoor-promoted Balaji Telefilms and Optymistix Entertainment Pvt. Ltd, which produces Comedy Nights Live on Colors, in the first round of the application process. In the second round, it got only three applications from Balaji Telefilms, BAG Films and Keylight Productions. However, neither of the two rounds concluded. An internal panel, scrutinizing the applications, found that certain applicants did not fit the eligibility criteria. While some had failed to submit the document fee, others did not submit the declaration that they had not been Doordarshan defaulters in the past. The auction was scrapped. Luckily for Doordarshan, Sircar eventually succeeded in reviving the auction with the help of the board. “The board of Prasar Bharati has unanimously resolved to execute the slot sale policy as a part of its ongoing efforts to make transactions more transparent," said Sircar. This episode sheds light on what ails the state-run broadcaster as it struggles to keep pace with competition from private television channels. Indian TV’s first soap ‘Hum Log’ aired on Doordarshan in the 1980s. With the gradual entry of private companies in the broadcasting business beginning 1991, Doordarshan has faced stiff competition over the years. With the gradual entry of private companies in the broadcasting business beginning 1991, Doordarshan has faced stiff competition over the years. Of late, both its revenues and viewership have seen a steep decline. According to Broadcast Audience Research Council (BARC) India, DD National registered 82.66 million impressions across rural and urban markets in the week ended 14 October, compared to the most-viewed channel Star Plus which had a viewership of 706.324 million impressions. DD National no longer finds a place among the 10 most-watched Hindi general entertainment channels in the urban and rural viewership matrix. Impressions (also known as television viewership in thousands) refer to the number of individuals in thousands of a target audience who viewed an event, averaged across minutes. Earlier, Sircar used to blame former TV audience measurement agency TAM Media Research Pvt. Ltd, which covered only the urban markets, and complained that Doordarshan is watched in rural India, which is not being measured. However, even after BARC India started covering rural markets in October 2015, Doordarshan’s ranking hasn’t improved. In fact, in the rural market television ratings, DD National ranked 13th with 27.86 million impressions in the week ended 14 October. Among the top three channels in the rural markets are Zee Anmol, Sony Pal and Star Utsav. Sircar, however, now believes that rural viewership coverage in India is incomplete because a lot of cable operators don’t carry Doordarshan channels even though it is mandatory to do so. “It is an institutional fault. I have made many complaints on this (to the ministry)," he said. Doordarshan operates 36 channels including regional, state, national and international channels, and a multichannel free-to-air direct-to-home (DTH) service, DD Free Dish. 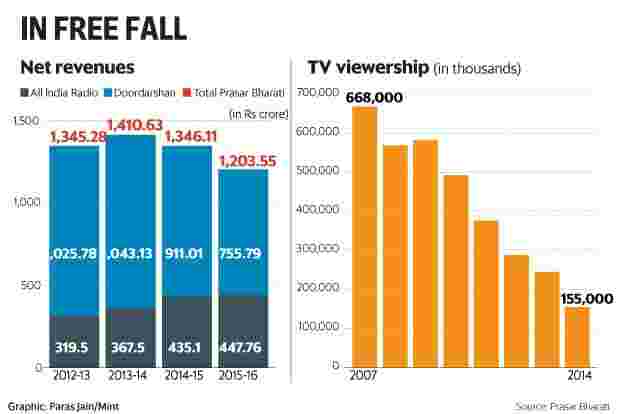 Doordarshan has seen its revenue decline from Rs911.01 crore in 2014-15 to Rs755.79 crore in 2015-16. In the past four years, its revenue has slipped by 26%, from Rs1,025.78 crore in 2012-13 to Rs755.79 crore in 2015-16. But Sircar believes that it was not as much the competition as the in-house forces that led to a decline in the popularity of the public broadcaster. In his view, lack of ambition, incompetence and half-baked policies have led to Doordarshan’s undoing. Sircar, a 1975 batch IAS officer from the West Bengal cadre who joined Prasar Bharati in 2012, claims that he has been trying to nudge the sleeping giant, but without much success. “I have been trying to make some die-hard Soviets come out of their shells and embrace the change that is happening in the industry," said Sircar, who feels that it is the public broadcaster’s reluctance to change and not the competence of private broadcasters that’s responsible for bringing Doordarshan to its knees. Stagnation and an uninspired workforce has been the bane of Doordarshan and a big roadblock to its progress, he added. Being a public broadcaster, the entire manpower of Doordarshan comes from the pool of government servants. According to a 2014 report by Sam Pitroda committee on Prasar Bharati, the broadcaster reportedly had 33,800 employees and a sanctioned strength of 48,022—the highest in the world for a public broadcaster. While BBC (British Broadcasting Corporation) had a staff strength of 16,858, public broadcasters of Japan and China stood at 10,000 each. Worse, there hasn’t been any infusion of fresh blood in the organization. While there may have been a few junior-level appointments, “no fresh blood to challenge the old modes of thought. The last recruitment programme was 20 years ago in 1996. The new employees which have come on board are just a few hundred and are being swamped by oldies", said Sircar. Interestingly, despite being given the status of an autonomous corporation in 1997, Prasar Bharati does not have an independent recruitment board. “The selection is done by a public sector recruitment agency BECIL (Broadcast Engineering Consultants India Ltd) which specializes in providing engineering staff only and not programming," said Mrinal Pande, a veteran journalist and the former chairman of Prasar Bharati. “Prasar Bharati has no autonomy when it comes to human resources and finances," said Pande. Clearly, the structural make-up of the organization has hindered the growth of Prasar Bharati for years. The genetic make-up of the government servants is no match for the dynamics of media where, according to Sircar, speed, adaption, learning and re-learning matter the most. That’s not all. In the past 30 years, no Prasar Bharati employee has undergone any training programme. “(The) present leadership was trained overseas in the UK, US and Canada about 30 years ago. In these 30 years, no programmer has attended even three-six months of training," said Sircar. In 2003, Doordarshan signed up for a self-finance commissioning (SFC) scheme, under which it would purchase programmes from the producers and then generate advertising revenue. Up until now, the broadcaster was inviting private producers to pay and use the national platform. All the iconic shows of 1980s including Nukkad, Buniyaad and Mahabharat— “not one was made by DD. These were the creations of the private producers who paid DD to reach out to the masses", said Sircar. Buniyaad (1986), one of the iconic shows of DD National. But with the new SFC scheme, Doordarshan started paying the production houses in full and generated ad revenues to recover its money. Eventually, producers lost interest in maintaining the quality of content and DD’s viewership numbers declined. “Earlier, there was an urge in the producers to produce good content. Under the SFC scheme, this urge was lost because it wasn’t their money that was at stake," Sircar said. Between 2007 and 2014, DD National registered a downfall of 513,000 TVT (television viewership in thousands), from an average of 668,000 TVT to 155,000 TVT in 2014, according to former television ratings agency TAM Media. In 2015, DD National garnered 115 million impressions on an average, according to BARC India, while the most-viewed television channels like Star Plus, Colors and Zee TV, on an average, command anywhere between 400 million and 700 million impressions every year. Mint got the viewership data from Prasar Bharati. However, data from BARC India and TAM Media is not comparable since viewership ratings by the latter were calculated using a different sample size and unit. “Doordarshan never took any risk with its programming formats in terms of variety, despite the viewership data in hand. Private television channels, on the other hand, had been providing a lot more variety with genre-dedicated channels. They easily experiment with their programming, which is not the case with Doordarshan as it is a state-controlled broadcaster," said a person familiar with the television industry who did not want to be identified because of his close relations with Doordarshan. As the viewership went down, the broadcaster also failed to generate enough advertising revenues to recover its costs. Its inability to generate revenues can also be attributed to the absence of an independent marketing division in the organization. “It was a vicious cycle. For Doordarshan, all these three things happened at the same time," said Ashish Bhasin, chairman and CEO of Dentsu Aegis Network South Asia. Bhasin further attributed Doordarshan’s failure to earn revenues to a lack of customer focus in its advertising. “Its business dealings have always been like a government department, trying to dictate work. Its terms during business negotiations were very unfriendly," he said. To be sure, DD has worked closely with certain external agencies and consulting firms for marketing solutions and also has a commercial division to manage advertising revenues. But due to low ad rates and lack of marketing specialization, revenues continue to decline. In 2015-16, Prasar Bharati saw a decline of Rs309 crore in its ad revenue, from Rs1,301 crore in 2014-15 to Rs992 crore. As for operational revenue, it recorded a loss of Rs400 crore, compared to Rs200 crore in 2014-15. Ramayana aired in 1987-88 on DD National. “There are two types of ad revenues—government and corporate. The government ad revenues, which include advertisements for various schemes under state and central governments, keep on fluctuating because of which the ad revenues are never stable," said Ranjan Mukherjee, additional director general (commerce) at Prasar Bharati. However, for 2015-16, the corporate ad revenue also saw a major dip. “We are working on the flexibility of the ad rates,"added Mukherjee. According to media buyer estimates, Doordarshan ad rates go up to Rs65,000 per 10 seconds of prime time, while private satellite channels command between Rs90,000 and Rs1.2 lakh for similar slots. Every year, more than half of Prasar Bharati’s total budget is provided by the information and broadcasting (I&B) ministry for salary and salary-related expenses and technical capital requirements. The rest of the operating expenses like administrative expenditures and programming expenses are to be borne by the broadcaster out of its own resources. For 2016-17, the I&B ministry has allocated Rs2,975 crore to Prasar Bharati, while its total budget stands at Rs4,083.63 crore for the same year. In 2015-16, the broadcaster’s accumulated loss totalled Rs2,108 crore, down from Rs11,449 crore in 2014-15—but only because a Rs9,000 crore loan was converted into grant-in-aid by the government. DD has always been acknowledged for its reach and coverage. Its national channel is the largest terrestrial network in the world, covering about 92% of the Indian population and 81% of the country’s land area, according to the Prasar Bharati website. But when the government is on the verge of completing its cable digitization drive, how many people are actually watching terrestrial TV? The Sam Pitroda committee tried to answer that question in 2014 when it said that terrestrial viewership in the country was down to 8% of TV households, which accounted for 12 million households out of 146 million households in 2014. Today, there are 153.5 million TV households as per BARC India. “But, nobody is watching terrestrial these days. The poorest of the poor are watching satellite channels," said media critic Sevanti Ninan, who is the editor of media watch website thehoot.org. Ninan further highlighted that despite DD’s free-to-air DTH platform DD Free Dish, the broadcaster refuses to disinvest in its terrestrial network. DD started DD Free Dish in 2004, but only started focusing on the platform after it realized that terrestrial transmission was a lost cause. “It’s true that Doordarshan blindly relied on its terrestrial coverage for a long time and put a lot of money behind terrestrial," said Sircar. It was in October 2015 when BARC India released rural viewership data that “Doordarshan woke up. We realized that the private players were ahead of us even in the rural markets and that too when they were just recycling their old programmes on their free-to-air channels", he said. “Their reheated pastries were selling more than Doordarshan’s paid-for pastries." In the rural viewership data by BARC India for the week ended 14 October, Zee Anmol topped the charts with 404.24 million impressions compared with DD’s 27.86 million. In the past four years, Sircar and his team have attempted to improve transparency and get DD back on its feet with little success. The new full-time director general, Supriya Sahu, has formed a committee to look into DD’s existing strategies and “bring transparency and credibility in Doordarshan". “We are calling it War Room and it is a set of 11 individuals who will help in repositioning Doordarshan. I have chosen people from different wings of Doordarshan who know the system well," said Sahu. Sahu added that this committee is working on 10 areas which include programming, marketing and fresh recruitments. The committee will soon be submitting a draft report on its findings. Sahu is a 1991 batch IAS officer from the Tamil Nadu cadre and was appointed as director general on 15 June. For almost two years, DD was under acting heads due to delays in regular appointments. In a clean-up drive, there have been a series of arrests and CBI (Central Bureau of Investigation) raids at DD offices across the country. According to data provided by Prasar Bharati, in the past three years, 62 of its officers have been charge sheeted, 61 others have been punished (from demotion to withholding promotion) and 11 officers are facing prosecution. “There are over 897 complaints that have been handled and processed in the last four years," said Sircar. Not just that, the broadcaster has also been working on its recruitment process to hire full-time industry experts and professionals. Suresh Chandra Panda, member (personnel) at Prasar Bharati, confirmed the development, saying that the broadcaster is looking to hire marketing professionals who will help in improving the ad revenues. “It is a board-approved policy," he said. Panda will also be taking charge as interim CEO of Prasar Bharati till the government completes the selection process for a new CEO. To be sure, the broadcaster had hired some highly-paid professionals a couple of years ago in DD News to turn the channel around. The result—in the English news segment (9-10pm), DD News viewership is almost five times higher than Times Now, which records the highest number of impressions among English news channels. According to BARC India data for the week ended 14 October, DD News garnered 18.18 million impressions, while Times Now, which was the most-watched English news channel, registered about 990,000 impressions. However, DD News does not fall under the category of English language news channels since it is a bilingual channel (English and Hindi) and BARC India lists it under Hindi news channels. Yet, its English language prime-time segment does better than Times Now. Among the Hindi news channels, Aaj Tak topped the charts with 131.64 million impressions, while DD News ranked 10th. “A lot of effort has gone into improving the look and feel of DD News, the content and packaging of stories. In prime-time English news segment, the channel is way ahead of others. Our channel is giving credible news," said A. Surya Prakash, chairman of Prasar Bharati. On 21 October, BECIL invited bids for the selection of a consulting company to revamp DD. BECIL will open bids on 15 November. According to the tender document, BECIL intends “to appoint a consultancy agency on behalf of Doordarshan for driving transformation of Doordarshan as a leading public service broadcaster". As for terrestrial coverage, the broadcaster has stopped terrestrial investments altogether and is now fully focused on its free-to-air DTH platform DD Free Dish. But the most important mission is to turn around the money-losing broadcaster. “It is not possible without going back to the earlier scheme of selling the slots," said Sircar. At the board meeting on 17 October, the Prasar Bharati board gave DD an ultimatum to start the auction process by 1 November before the retirement of Sircar. “It took us two rounds to get the plan rolling. This shows the internal resistance in the organization. The third and fresh round will be the final amended round," said Sircar. He further added that the board has simplified the process and accepted suggestions made by the producers during their recent discussions with DD. “The biggest change is that we will now be holding a physical auction (by inviting sealed bids) instead of an electronic one to avoid any technical challenges. DD is back to its old successful model, with such variations that are appropriate under the changed circumstances. It’s all procedural from here," he added. According to the current policy, a production house is eligible to bid if it has logged an annual revenue of at least Rs3 crore in each of the past three fiscal years and has produced at least 200 hours of general entertainment programming, including feature films in the past three calendar years. The auction will take place on 14 and 15 December and the broadcaster will roll out fresh programming in February 2017. An executive from a production house that is keen to bid for DD slots but does not want to be identified, however, said that there is no clarity from the broadcaster. “For someone who wants to revive its own network with this auction, there is no collaborative way of working in Doordarshan," the executive said, referring to the two failed application rounds. “Doordarshan has been operating in a very bureaucratic way. It needs to make up its mind," the executive added. Prasar Bharati, however, is also planning to auction its feature film slots on its national channel after the slot sale policy for prime-time programming is in place. Currently, DD has a policy of purchasing one-time telecast rights to movies and generating ad revenue. “Films is another sad story on Doordarshan. We have been trying to streamline the film procurement process after we found that certain movie rights’ owners were trying to promote cartelization while procuring films," said Sircar. In the streamlining process, the broadcaster had referred the matter to its internal vigilance division to keep a check on film procurement agreements after a 2013 internal report highlighted financial irregularities in the deals between DD employees and film producers. Rajyavardhan Rathore, minister of state for information and broadcasting, said that Prasar Bharati has been working on its strategies to improve its content and services. “Prasar Bharati is coming up with methods to improve its service. In terms of entertainment, DD National is working on improving its content—slot-sale is a part of that process," he said. Rathore added that DD is passing through a tough period right now and “the revenues will automatically shape up in times to come". Media industry experts, on the other hand, say that there is little scope for DD’s revival. “The only purpose it serves is as a mouthpiece for the government of the day. There is no conviction about public broadcasting anymore. It’s a lost cause," said media critic Ninan. But Sircar isn’t giving up. “It’s a race to the finish now," he said.